The Republic of Malawi is a landlocked nation in Southern Africa, although sometimes it is considered to also be situated in East Africa. It is one of sub-Saharan Africa's most densely populated countries. Migrations and tribal conflicts precluded the formation of a cohesive Malawian society until the turn of the twentieth century. In more recent years, ethnic and tribal distinctions have diminished, and today no significant friction exists and the concept of a Malawian nationality has begun to take hold. Predominantly a rural people, Malawians are generally conservative and traditionally nonviolent. They rejected a one-party state in a 1993 referendum and peacefully installed a multiparty democracy. Most of the people live by subsistence agriculture, and there is widespread poverty. Hominid remains and stone implements have been identified in Malawi dating back more than one million years, and early humans inhabited the vicinity of Lake Malawi fifty thousand to sixty thousand years ago. Human remains at a site dated about 8000 B.C.E. show physical characteristics similar to peoples living today in the Horn of Africa. At another site, dated 1500 B.C.E., the remains possess features resembling Bushman people. Although the Portuguese reached the area in the sixteenth century, the first significant Western contact was the arrival of David Livingstone along the shore of Lake Malawi in 1859. Subsequently, Scottish Presbyterian churches established missions in Malawi. One of their objectives was to end the slave trade to the Persian Gulf that continued to the end of the nineteenth century. In 1878, a number of traders, mostly from Glasgow, formed the African Lakes Company to supply goods and services to the missionaries. Other missionaries, traders, hunters, and planters soon followed. In 1891, the British established the British Central Africa Protectorate, and by 1907, the Nyasaland Protectorate (Nyasa is the Yao word for "lake"). Although the British remained in control during the first half of the 1900s, this period was marked by a number of unsuccessful Malawian attempts to obtain independence. A growing European and U.S.-educated African elite became increasingly vocal and politically active. During the 1950s, pressure for independence increased when Nyasaland was joined with Northern and Southern Rhodesia to form the Federation of Rhodesia and Nyasaland. In July 1958, Dr. Hastings Kamuzu Banda returned to the country after a long absence. He assumed leadership of the Nyasaland African Congress (NAC), which later became the Malawi Congress Party (MCP), and in 1960 participated in a constitutional conference in London. In a second constitutional conference two years later, the British agreed to give Nyasaland self-governing status the following year. The Federation of Rhodesia and Nyasaland was dissolved late in 1963, and Malawi became fully independent the next year. In 1966, Malawi became a republic, with Dr. Banda as its first president, and was also declared a one-party state. In 1970 Dr. Banda was declared president for life of the MCP, and in 1971 he consolidated his power and was named president-for-life of Malawi itself. The paramilitary wing of the MCP, the Young Pioneers, helped keep Malawi under authoritarian control until the 1990s. Increasing domestic unrest and pressure from Malawian churches and the international community led to a referendum in 1993 in which the Malawian people were asked to choose between a multiparty democracy or a one-party state. They voted overwhelmingly in favor of multiparty democracy. Bakili Muluzi, leader of the United Democratic Front (UDF), was elected president in the elections held the next year. Malawi's new constitution (1995) eliminated special powers previously reserved for the MCP. Accelerated economic liberalization and structural reform accompanied the political transition. Muluzi was re-elected in 1999 for a second five-year term. Malawi saw its first transition between democratically elected presidents in 2004, when the UDF's presidential candidate, Bingu wa Mutharika, won. Mutharika left the UDF in 2005—citing differences, particularly over his anti-corruption campaign—and formed the Democratic Progressive Party. Malawi is situated in southeastern Africa. It is bordered by Tanzania to the north, Zambia on the northwest, and Mozambique on the east, south, and west. The Great Rift Valley traverses the country from north to south. 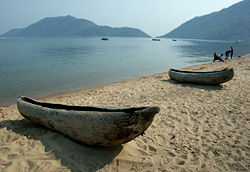 In this deep trough lies Lake Malawi (also called Lake Nyasa), the third-largest lake in Africa, comprising about 20 percent of Malawi's area and stretching along most of its eastern border. The Great Rift Valley runs through the country from north to south, and to the east of the valley lies Lake Malawi (also called Lake Nyasa), making up over three-quarters of Malawi's eastern boundary. The surface of Lake Malawi is located at 1,500 feet (457 m) above sea level, with a maximum depth of 2,300 feet (701 m), which means the lake bottom is over 700 feet (213 m) below sea level at some points. The Shire River flows from the south end of the lake and joins the Zambezi River 250 miles (400 km) farther south in Mozambique. East and west of the Rift Valley, the land forms high plateaus. In the north, the Nyika Uplands rise as high as 8,500 feet (2,600 meters); south of the lake lie the Shire Highlands, rising to Mount Zomba and Mount Mulanje, 7,000 and 10,000 feet (2,130 and 3,048 meters). In the extreme south, the elevation is only 200-300 feet (60-90 meters) above sea level. The islands of Likoma and Chisumula belong to Malawi but lie entirely within Mozambique territorial waters, forming maritime enclaves. Malawi is one of Sub-Saharan Africa's most densely populated countries with a population of 12 million. The population of Lilongwe —Malawi's capital since 1971— exceeds 400,000. All government ministries and the Parliament are located in Lilongwe. Blantyre remains Malawi's major commercial center and largest city. Malawi's climate is generally subtropical. A rainy season runs from November through April. There is little to no rainfall throughout the rest of the year. The government of Malawi has been a multiparty democracy since 1994. Under the 1995 constitution, the president, who is both chief of state and head of the government, is chosen through universal direct suffrage every five years. The members of the cabinet are appointed by the president. Malawi's National Assembly has 193 seats, all directly elected to serve five-year terms. The constitution also provides for a second chamber, a Senate of 80 seats, but to date no action has been taken to create it. The Senate is intended to provide representation for traditional leaders and the different geographical districts, as well as various special interest groups, such as women, youth, and the disabled. The constitution provides for an independent judiciary. Malawi's judicial system, based on the English model, is made up of magisterial lower courts, a High Court, and a Supreme Court of Appeal. Local government is carried out in 28 districts within three regions administered by regional administrators and district commissioners who are appointed by the central government. In the first local elections in the multiparty era, which took place in 2000, the UDF party won 70 percent of the seats. In the third multiparty presidential and parliamentary elections, European Union and Commonwealth observers noted "serious inadequacies" in the poll. The authorities at times interfered with opposition party functions or used violence to disperse crowds. Individuals, however, were generally free to criticize the government without fear of reprisal. The government-owned radio and television stations dominate media coverage and clearly favor the president and his party, but a broad spectrum of opinion is available in newspapers and other independent media. Concerns were raised in 2006 about President Mutharika's growing ties to Zimbabwe. Opposition leaders said he diverted UN food aid to Zimbabwe. The president's wife is Zimbabwean. Although the government generally respects human rights, there are problems in some areas, including use of excessive force by police; harsh prison conditions; limits on freedom of the press, speech, and assembly; discrimination and violence against women, trafficking in women and children, especially for sexual exploitation; and child labor in agriculture and domestic service, largely as a result of extreme poverty. Important bilateral donors, in addition to the U.S., include Canada, Libya, Germany, Iceland, Japan, the Netherlands, Norway, Sweden, Taiwan, and the United Kingdom. Multilateral donors include the World Bank, the IMF, the European Union, the African Development Bank, and United Nations organizations. Malawi is a landlocked, densely populated country. Its economy is heavily dependent on agriculture. Malawi has few exploitable mineral resources. Its three most important export crops are (in order) tobacco, tea, and sugar. Malawi's president recently urged farmers to consider growing other crops, such as cotton, as an alternative to the country's principal crop, tobacco, as cigarette consumption in the West continues to decline. Traditionally Malawi has been self-sufficient in its staple food, maize, and during the 1980s exported substantial quantities to its drought-stricken neighbors. Agriculture represents 38.6 percent of the Gross Domestic Product (GDP), accounts for over 80 percent of the labor force, and represents about 80 percent of all exports. Nearly 90 percent of the population engages in subsistence farming. Smallholder farmers produce a variety of crops, including maize (corn), beans, rice, cassava, tobacco, and groundnuts (peanuts).The agricultural sector contributes about 63.7 percent of total income for the rural population, 65 percent of manufacturing sector’s raw materials, and approximately 87 percent of total employment. Financial wealth is generally concentrated in the hands of a small elite. Malawi's manufacturing industries are situated around the city of Blantyre. Malawi's economic reliance on the export of agricultural commodities renders it particularly vulnerable to external shocks such as declining terms of trade and drought. High transport costs, which can comprise over 30 percent of its total import bill, constitute a serious impediment to economic development and trade. Malawi must import all its fuel products. Paucity of skilled labor; bureaucratic red tape; corruption; and inadequate and deteriorating road, electricity, water, and telecommunications infrastructure further hinder economic development. However, recent government initiatives targeting improvements in the road infrastructure, together with private-sector participation in railroad and telecommunications, have begun to render the investment environment more attractive. Malawi has undertaken economic structural adjustment programs supported by the World Bank, the International Monetary Fund (IMF), and other donors since 1981. Broad reform objectives include stimulation of private-sector activity and participation through the elimination of price controls and industrial licensing, liberalization of trade and foreign exchange, rationalization of taxes, privatization of state-owned enterprises, and civil service reform. Malawi qualified for Highly Indebted Poor Country (HIPC) debt relief. Real GDP increased by an estimated 3.9 percent in 2004. Inflation has been largely under control since 2003. 9 to 10 year old boys of the Yao tribe participating in circumcision and initiation rites. Malawi derives its name from the Maravi, a Bantu people who came from the southern Congo about six hundred years ago. On reaching the area north of Lake Malawi, the Maravi divided. One branch, the ancestors of the present-day Chewas, moved south to the west bank of the lake. The other, the ancestors of the Nyanjas, moved down the east bank to the southern part of the country. By 1500 C.E., the two divisions of the tribe had established a kingdom stretching from north of the present-day city of Nkhotakota to the Zambezi River in the south, and from Lake Malawi in the east to the Luangwa River in Zambia in the west. The Chewas constitute 90 percent of the population of the central region; the Nyanja tribe predominates in the south and the Tumbuka in the north. In addition, significant numbers of the Tongas live in the north; Ngonis—an offshoot of the Zulus who came from South Africa in the early 1800s—live in the lower northern and lower central regions; and the Yao, who are mostly Muslim, live along the southeastern border with Mozambique. 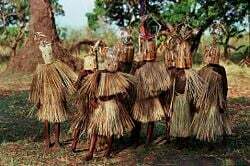 Traditional dances and rituals as well as arts and crafts act as identifying factors. More than half of the country's children live in poverty, mostly in rural areas. Malawi has a high rate of AIDS, and a correspondingly high number (an estimated one million) of orphans, most of whose parents died from AIDS. While primary education is free, families must pay book fees and purchase uniforms. Girls, especially in rural areas, often do not complete even their primary education and are at a disadvantage in finding jobs. Only one-third of children have access to safe drinking water, and child malnutrition is a serious problem. Malawi is known as the "Warm Heart of Africa." Malawi is known as the "Warm Heart of Africa." The people are particularly respectful and polite. In the rural areas, a person will not pass by another without extending a greeting of "Zikomo." The people take great pride in keeping their homes well cared for. Thatched roofs are evenly trimmed, and mud floors are regularly scrubbed. Malawians have an extraordinary sense of loyalty, with a strong bond to their family and clan. There are several tribes in Malawi, each with its own culture. The Chewa are matrilineal. Among these people, the husband will come live in his wife's village. In these villages, the huts of the daughters will cluster around their mother's hut. The mother's brothers have a parental relationship to their sisters' children. This relationship is often stronger than the relationship of children to their physical father. Malawi has a variety of religious denominations that operate in an atmosphere of tolerance. It is estimated that about 80 percent of the population is Christian, Islam has about 12 percent, other faiths claim about 3 percent, and 4 percent claimed "none" according to the 1998 census. From 1964–2010, the Flag of Malawi was made up of three equal horizontal stripes of black, red, and green with a red rising sun superimposed in the center of the black stripe. The black stripe represented the African people, the red represented the blood of martyrs for African freedom, green represented Malawi's ever-green nature, and the rising sun represented the dawn of freedom and hope for Africa. In 2010, the flag was changed, altering the order of the horizontal stripes to red, black, and green, removing the red rising sun, and adding a full white sun in the center as a symbol of Malawi's economic progress. ↑ 1.0 1.1 Bruce Berry, Malawi Flags of the World Website (February 6, 2005). Retrieved December 2, 2011. ↑ Malawi National Anthem Lyrics. National Anthem Lyrics. Lyrics on Demand. Retrieved December 3, 2011. ↑ 3.0 3.1 3.2 Country profile: Malawi. BBC News Online. BBC (March 13, 2008). Retrieved December 3, 2011. ↑ Benson, Todd. Chapter 1: An Introduction (PDF). Malawi: An Atlas of Social Statistics. National Statistical Office, Government of Malawi. Retrieved December 3, 2011. ↑ 5.0 5.1 5.2 5.3 Malawi. International Monetary Fund. Retrieved December 28, 2011. ↑ Charles H. Cutter, Africa 2006 (Harpers Ferry, WV: Stryker-Post Publications, 2006, ISBN 1887985727), 142. ↑ The Warm Heart of Africa Malawi Tourism Guide. Retrieved December 28, 2011. BBC News Malawi Profile News Africa (26 October 2006). Retrieved December 2, 2011. Central Intelligence Agency, "Malawi" CIA World Factbook. Retrieved December 2, 2011. This page was last modified on 8 August 2018, at 16:13.